(Los Angeles) – Freshman JT Daniels, in his first college career game, shook off a slow start to throw for 282 yards and a touchdown to lead USC to a 43-21 victory over UNLV Saturday before 58,708 at the LA Memorial Coliseum. Daniels completed 22 of 35 in the process. He missed a couple receivers and was hurt by some dropped balls early but seemed to find his groove as the game went on. A pair of Chase McGrath field goals from 46 and 38 yards gave USC a 6-0 lead in the first quarter. But Lexington Thomas broke off a 71-yard touchdown on a sweep as the Rebels took a 7-6 lead with 2:37 left in the quarter. UNLV needed just two plays to go 75 yards. McGrath booted a 29-yard field goal early in the second quarter as the Trojans had to settle for three again after driving 81 yards on 12 plays to take a 9-7 lead. However on the ensuing possession UNLV went 75 yards on 7 plays in a drive that featured a fake punt that resulted in a first down. Armani Rogers hit Kendal Keys on a 31-yard touchdown pass to cap it and put the Rebels up 14-9 with 10:32 remaining in the second quarter. 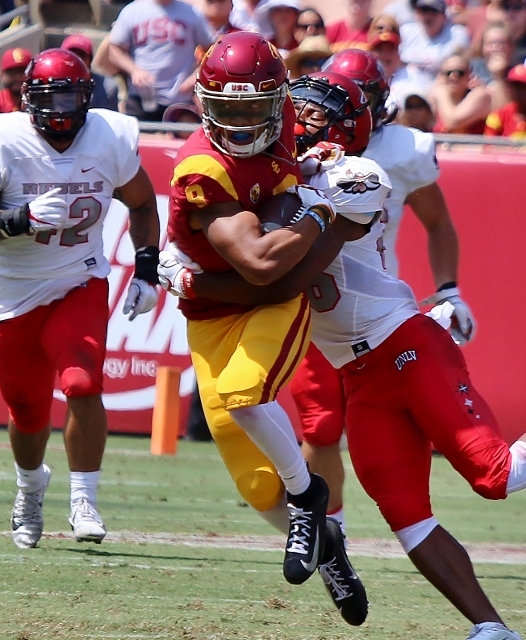 On the next possession a long Velus Jones kickoff return put USC in scoring position at the UNLV 25. 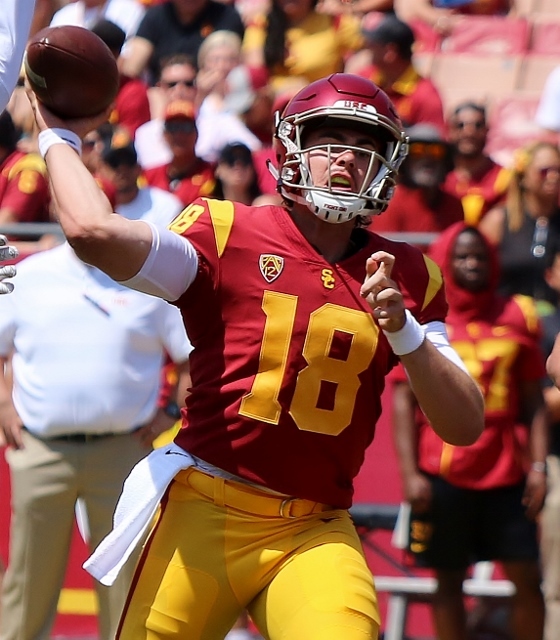 But the drive stalled and again Clay Helton called on McGrath who delivered with a 47-yard boot that split the uprights for his fourth of the day. Later in the quarter, a 40-yard Stephen Carr run set up a two-yard touchdown blast by Vavae Malepeai with 1:03 left to give the Trojans a 19-14 lead. USC marched 79 yards in 8 plays. USC took the 19-14 lead into the break. Daniels had completed 13 of 23 for 115 yards in the first half. Amon-Ra St. Brown, his go to guy at Mater Dei as well, caught six passes for 55 yards. Carr had seven carries for 51 yards. Thomas rushed for 87 yards on six tries for UNLV in the first half. Both teams punted twice in the third quarter. On the first play of the fourth quarter Daniels hit St. Brown in stride for a 43-yard touchdown pass to extend the USC lead to 26-14. The Trojans used four plays to go 69 yards. After UNLV was forced to punt the Trojans cashed in again. Aca Cedric Ware capped a 59-yard drive with a 15-yard run and the advantage was extended to 33-14. The Rebels responded with a five-yard touchdown strike from Armani Rogers to Giovanni Fauolo to cap a 75 yard drive to cut the lead to 33-21 with 8:06 left. The Trojans quickly wrapped it up though with another McGrath field goal from 36 yards out – his fifth of the game – and a 20-yard touchdown run by Malepeai. 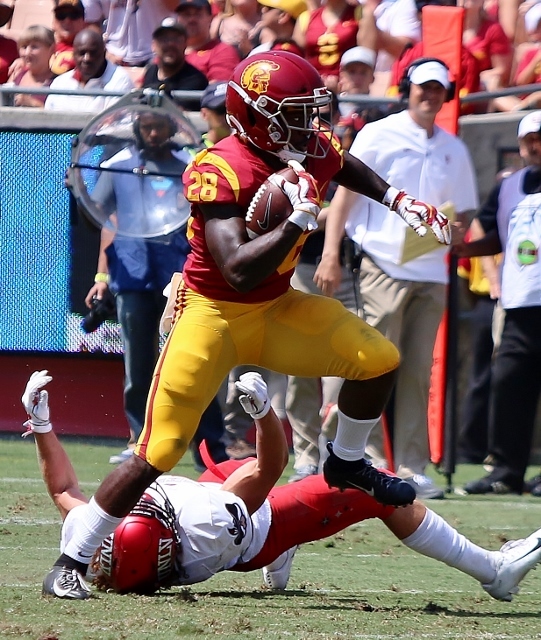 Ware led the USC rushing attack with 100 yards on 10 carries and Carr added 54 on nine. Malepeai finished with 47 yards to go along with his two scores. St. Brown reeled in 7 receptions for 98 yards and a touchdown. Thomas rushed for 136 yards for the Rebels and Rogers ran for 82 yards on 18 carries and passed for 97 and two scores but it wasn’t nearly enough. Next up for USC is a date at Stanford next Saturday.